Last week, we asked our members to vote on their favorite customer website. One week and 800+ votes later, the three lucky winners have been chosen. The results were very close – many of the top spots were only 3 votes apart! Each winner will receive some awesome prizes, and all 20 of our finalists will be featured in our upcoming customer showcase page. Thanks again to everyone who participated. It was loads of fun to explore each entry, and to see all of the wonderful websites that have been created using our themes. Mugs cafe is a testament to simplicity, taking our foxy theme and stripping it down to emphasize clear and beautiful typography. The website also makes great use of our Shortcodes, transforming a standard full-width homepage into a dynamic page packed full of great information. Unlike Mugs Cafe, Jones The Painter is all about imagery. The website’s design takes a back seat to the artist’s beautiful works, giving meaning to the theme’s fitting name “SimplePress.” I especially like the subtle use of background imagery in the logo, which gives depth to the page. The website also makes great use of our Page Templates, using our Gallery page template to display the artist’s paintings. Crank Cow Milk isn’t simple, and it certainly isn’t stripped down, but the result is a fun and engaging design that fits perfectly with the brand’s playful message and witty personality. What a versatile selection of winners we have – each showcasing a dramatically different, and yet completely successful approach. This contest was great fun, and celebrating our customers is something we plan to do much more in the future! For those who won, you will be receiving an email within the next couple days with information about how to redeem your prizes. Three awesome winners. Personally voted for one of them and I think you guys are right on the winner. Stripped down to give a great look. I am not sure what you mean by capacity problems. All three sites seem to be loading for me, though it’s true that a good hosting plan is of the utmost importance! Second & third sites are based in New Zealand and Australia where there is only one data cable through the Pacific Ocean to the USA & rest of the world. So in addition to possible shared hosting issues, there can also be intermittent problems with the data getting through (it’s a complex subject) – I’ve experienced this before. 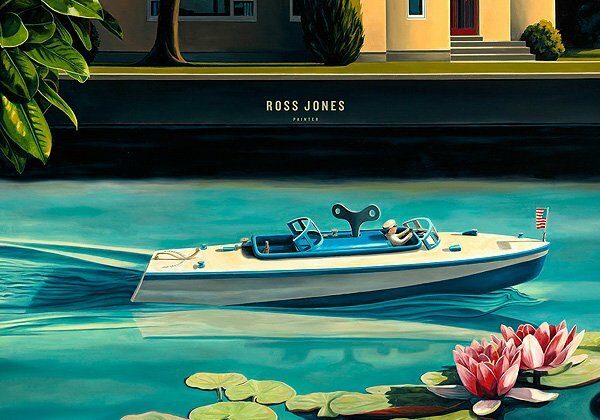 Jonesthepainter is hosted with New Zealand’s largest provider, but I have to say I haven’t been impressed with their reliability or speed – I’ve found that a site I have hosted in USA is faster than using a local host. So I think I’ll look at moving my sites with the new Hostgator prize. Big thanks to Nick and ElegantThemes. I also had problems with site outage… with old cranky. It is great to be connected with users, websites and their issues. I think this comments section seems to be playing up a little or is not very optimised for hand held devices. Very buggy trying to edit text in this text box. More competitions & challenges would be great. Well done elegant themes…..
WOW! Thanks. Still cannot believe I won. Cool contest & congrats to the winners! I wanted to now if Mugs Coffee used an eleganttheme shortcode for its event section? Absolutely fantastic to wake up this morning to read my website came 2nd, A huge thank you to Grant Pascoe for his fantastic design work. To everyone that voted for the site, Thanks, you guys and girls are awesome. Congratulations to Mugs Cafe and Cranky Cow Milk love your sites in fact all the sites featured were great. Congrats on having such a beautiful site 🙂 I love the artwork as well. I’ve really been enjoying the posts lately, keep it up! It makes me feel more like part of the ET community. Thanks Laska, we will be publishing many more customer spotlights in the future! We love the simplicity of the top winning site. How about a contest for sites that alter the template minimally, or not-at-all? What a fantastic start to the day!!! I was so happy that the site for Cranky Cow made it to the top 20 but to make it to the top 3 is awesome!! 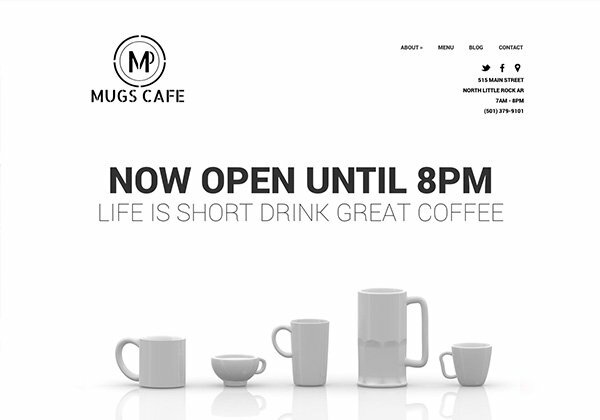 Congrats to Mugs Cafe and Jones the Painter – I just love the simplicity of your sites (and it really is about what works best for your client)! In fact all the top 20 sites were great and I personally found it really difficult to choose three to vote for. Re comments on site availability, yes, it’s a sad fact of life that shared hosting isn’t always the best, but because my clients organise their own hosting I don’t always have a lot of control over that. Aussie based hosting can be patchy sometimes, but I rarely have problems with sites hosted in the US. That said, the Cranky Cow site was OK when I checked just now. Anyways, thanks to Nick and Elegant Themes, and to everyone who voted 🙂 Have a fantastic day!! Cheers, Ellen. All registered sites are beautiful. It was hard to choose just 3. Congratulations to the winners! Plenty of Love, much fresh air and a little bit coffee. Great choices Nick (I did not win)! I was also wondering what social plugin did you use for the floating social media bar at left. Please do share. Loved all the websites but happy that the artist won. He had some really awesome work. Thanks Again Elegant Themes and Nick for your awesome work. Congratulation to all 3 Winners, all done fantastic job. Inspired work from all developers. Congrats to the winners, great job! Elegant Themes` WordPress themes are just great, however I wonder if ET could also step into designing Adobe Muse themes? What do you think? @Nick, considering that every other 5th job in this country is car related, don’t you think it will be nice to have a car / automobile theme? WOW! Super impressed. I must step up my game!! Great & inspiring job! which theme did you use as the parent in Cranky Cow? It’s highly customized, but it’s Foxy. .com was taken so…and yes it’s Foxy. Can I be featured in the Elegant Themes Customer Showcase? Any feedback we can do to get into the showcase? Wow, These themes look pretty cool ! Really Beautiful design with new concept of motivation. When was this email about the contest sent? I never received anything, i would of like to submit my website.